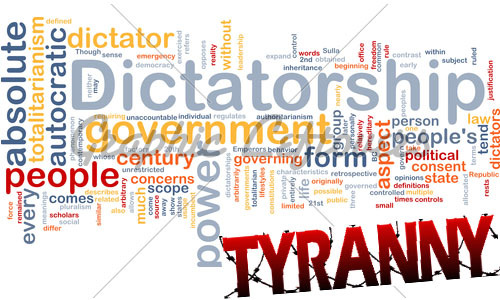 Delving deep in to the history of state governance would tell us that no negative connotations were attached to the two words; tyranny & dictatorship. In ancient Greece, rulers of city states traditionally held the title ‘tyrant’, and the subjects never had any reservation for the same, as no negativity was stigmatized to it. In Athens, before democracy set foot there, the last tyrant ruler was particularly unfair in using power, and the term got a bad name. Subsequently Plato and his followers, by their political discourse, gave permanence to the attachment. On the other hand, in Republican Rome, a dictator was a senate appointed constitutional incumbent who held absolute power in matters of governance as well as military duties. Titus Flavus was the first dictator of Republican Rome. Augustus Caesar was the last dictator of Rome, who killed his dictator-grandfather, and this act of him gave a bad rap to the term ‘dictator’. Dictator: A dictator is the head of a government which is run according to the will of the dictator, who acquires power without the consent of the people and is aided by a bunch of loyalists. Under dictatorship all political power is monopolised by the dictator, and the pillars of governance namely judiciary, administration, and legislature are controlled by him and run by the coterie. Dictatorship is an authoritarian form of government where both public and private lives of citizens are subject to scrutiny and regulation by the government. All voices of resent are brutally suppressed by the dictator, through private militia or state force. Adolf Hitler of Germany, Idi Amin of Uganda, Ayatollah Khomeini of Iran, Saddam Hussein of Iraq, and Aga Khan of Pakistan are few of the world in-famous dictators. Tyranny: Tyranny is a form of government where the head of the government possesses very oppressive and ruthless character, and often looks after his own interest instead that of the subjects. The administration, judiciary, and legislature are controlled by people hand-picked by him. History is witness to the fact of many monarchs turning tyrant due to greed and oppressive character. The tyrant rules his subjects through the weapons of fear, and torture. Tyranny is supposedly worst form of governance, where the ruler is corrupted to thefullest. All the tyrants are filthy rich, where the wealth is amassed through all possible illegal ways imaginable. Pol Pot of Cambodia, Pinochet of Chile, Henry VIII of England, Genghis Khan of Mongolia, Saddam Hussein of Iraq, and Caligula of Rome are some of the worst tyrants the world has seen. A dictator may rise to power either in a democratic set-up, or through an armed coup, often by ambitious military officers. Such leaders definitely possess leadership quality to launch an armed offensive against the ruler. Initially, after coming to power, such leaders have been seen to implement strict discipline into the society, and take measures to bring in financial accountability in governance. But dictatorial power, politics of appeasement, lure to become rich and live 5-star life-style ultimately make the dictator a tyrant, when he starts to consider his whims as law and destiny of the citizens. The tyrant takes all possible measures to silence any voice or resent and large-scale elimination takes place. A military dictator initially rules by law, stifling personal freedom of people, but may not nurse any personal financial-ambition. But after staying in power for a long time, all the administrative and military posts are filled by people chosen by the dictator so that governance becomes smooth and conducive to serve self interest, and also seeds of revolt are destroyed at birth. This is when the dictator becomes tyrant. This is what happened to some dictators like Muammar Gaddafi of Libya, Zia Ul Haque and Musharraf of Pakistan, and many others. Thus length of tenure and degree of mis-use of power differentiates between a dictator and a tyrant. increased industrial production, and all round discipline in the government. Cuba under Fidel Castro, India under Indira Gandhi, and Pakistan under Zia experienced such things. But tyrants are bereft of any positive contribution towards societal welfare. Idi Amin of Uganda, Henry VIII of England, Stalin of Russia, Pol Pot of Cambodia and many other tyrants will be remembered by the world for the unbearable misery they brought for their subjects. A tyrant essentially is a dictator. The difference between a dictator and a tyrant is determined by length of tenure and degree of misuse of power. A dictator assumes power without consent of the people, either through an armed ouster of the ruler or through heredity. He might be a good leader and may bring some prosperity for the people. But as the dictator stays in power for long period, he may become tyrant treating the citizens according to his whims. What is the difference between Tyranny and Despotism? tapas. "Difference between Tyranny and Dictatorship." DifferenceBetween.net. December 28, 2014 < http://www.differencebetween.net/miscellaneous/politics/difference-between-tyranny-and-dictatorship/ >. Fidel Castro is in the wrong section. There is no welfare of the people under his rule. Ask the million Cubans has fled Cuba because of political prosecution and economic destruction. Fidel Castro declared his regime a Marxist communist one. You may also ask hundred thousand Venezuelans that are starting to leave Venezuela because the Cuban regime was imported into Venezuela about 15 years ago under the rule of traitor socialist Hugo Chavez. Fidel should be in the section “Difference in meaning-Dictator”. By the way, both dictators and tyrants are filthy rich, filthy criminals and filthy deceivers. The fact that socialist Barack Obama and socialist Pope Francis are trying to legitimize the criminal Cuban regime to the eyes of the world does not make it a good regime nor delete from history all the misery they brought to their people. It just means that both Obama and Pope Francis belong to the same mafia as the Castro brothers (Fidel and Raul). Excellent response. There was absolutely no benefits or welfare fpr the cuban or the venezuelan people. There were lots of torture in both. Cuba has free health care and some of the best doctors in the world. Americans often take trips over there to get patched up for free, the airfair is cheaper than what it would cost to see the doc and get medicine in the states. And the economic destruction was caused by the sanctions the US placed upon them. Using the ancient terms of Rome, a dictator was an elected leader who held supreme power. Rome conferred such power during time of war, typically an “existential war”. The power cold be and was withdraw after the emergency ended. The later Roman emperors were nominally selected by the Senate (perhaps under physical threat), served for life, and held supreme power. A tyrant seized supreme power without the pretense of legality. In roman times, tyrant was a negative term.